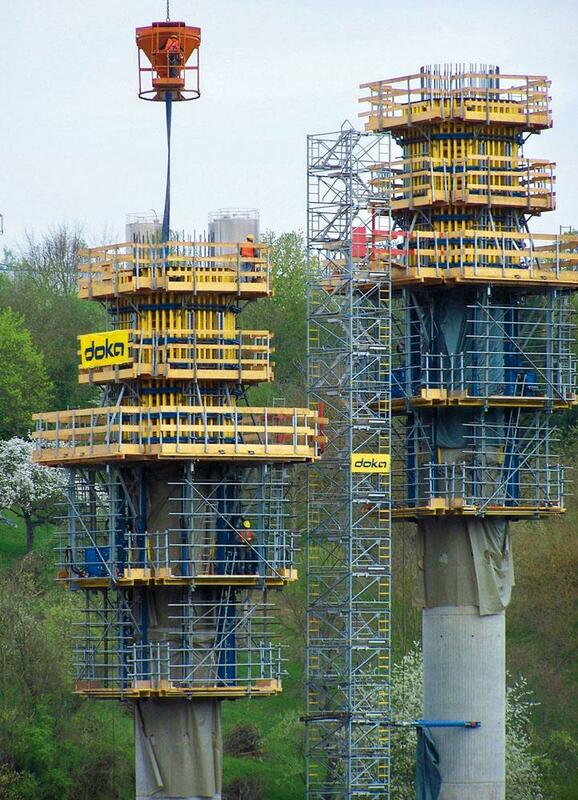 Doka’s formwork expertise is currently in demand during the construction of one of the busiest motorway viaducts in Germany. The Lahntal bridge located in Limburg dates back to the early nineteen-sixties and is 400-metre long. Every day about 100,000 vehicles cross the valley of the River Lahn on the viaduct. Its traffic load has increased sharply, so a new bridge is being built sited just a few metres west of the old viaduct. 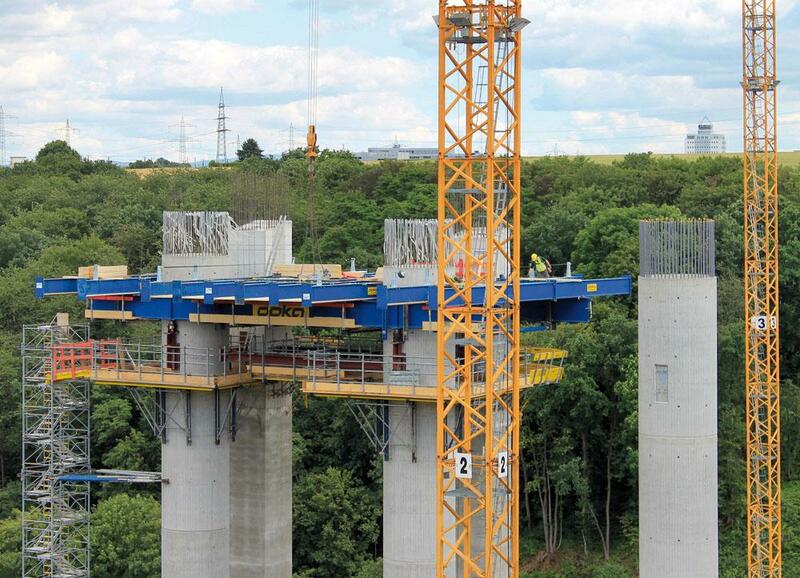 The new Lahntal viaduct will measure a massive 43.50 metres overall in width. So in future, there will be a total of eight lanes, plus hard shoulders. A major improvement over the old motorway bridge. It had only six lanes, and no hard shoulder. Work started in September 2013, with the new bridge scheduled to be open for traffic in autumn 2016. The project is funded by Germany's federal government and total cost will be around EUR 92.7 million. The old bridge is due to be fully demolished and removed by autumn 2017. Work overall is scheduled for completion by the end of 2017. The beam bridge 450 metres in length is a design by the joint venture of 'Bürogemeinschaft Konstruktionsgruppe Bauen' from Kempten and Munich-based architects 'Architekturbüro Karl + Probst'. The roadways are 62 metres above the lowest point of the valley floor and the seven spans range from 45 to 90 metres in length. No bridge pier had to be set in the waters of the River Lahn itself. Haunched, twin-cell pre-stressed concrete box girders form the superstructures. 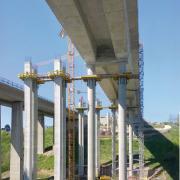 Pairs of super-slim, circular reinforced concrete columns will transfer the loads of the bridge. Maximum pier diameter is a mere 2.80 m, and the tallest piers stand 57.0 metres high. 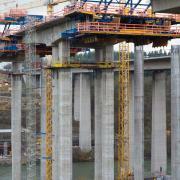 Cantilevering method is used to construct the superstructures. 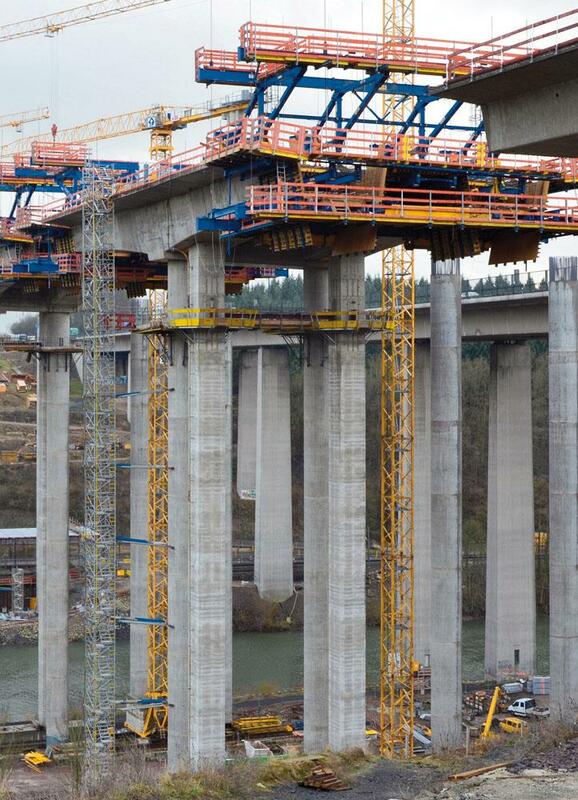 Secondary pier structures provide additional stability for the build phase. Lead contractor is Max Bögl Stiftung & Co. KG. 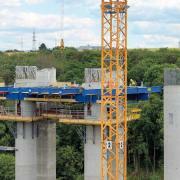 Doka was awarded the contract for the extensive formwork technology. 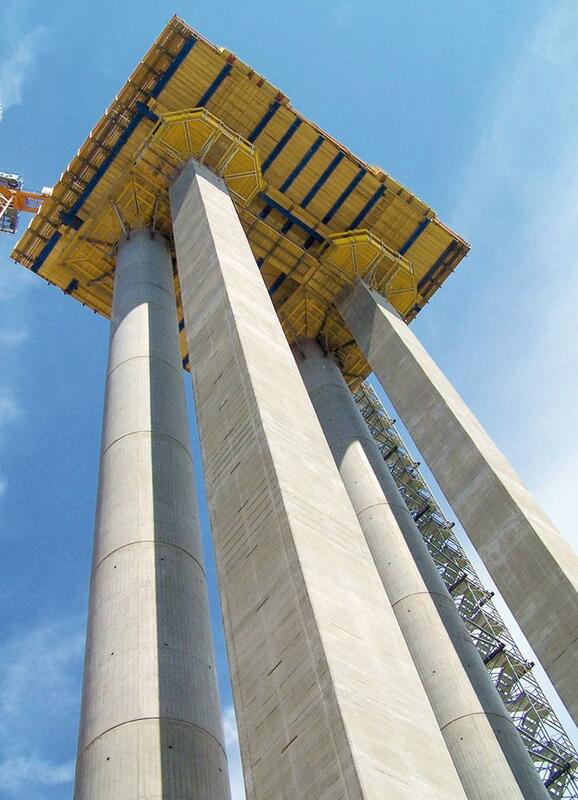 Automatic climbing formwork Xclimb 60 is used to build the circular-section columns of the primary piers. The system climbs hydraulically and is anchored to the structure at all times by guiding shoes. So it can climb even when wind speeds are as high as 72 km/h. The formwork itself is made up of Large-area formwork Top 50 planned specifically for this project. The panels consist of Timber formwork beams H20 top and Steel walings WU14. Maximum pouring height is 5.75 m at a formwork height of up to 6.00 m. Ladder systems XS with cages ensure safe up/down access between the three platform levels. Asymmetric pier heads are the springers for cantilever construction. The pier heads are constructed on top of each pair of primary piers and are anchored into the adjacent pair of secondary piers. There are 675 m³ of concrete in each pier head. This corresponds to a concrete self-weight of just under 1,700 metric tons. Plus the weight of the reinforcement and the weight of the formwork. The pier heads are poured in three casting steps. The heavy steel structure used is 90 % Doka rental material. The entire formwork solution for the pier heads plus falsework came from Doka, so everything was from a single source. Two Primary beams HEB 1000 each 20.0 metres long are the basis of each pier-head formwork structure. The secondary beams are ten coupled Anchoring cross beam CFT. Together they carry a closed workspace flat measuring 340 m² poised at heights up to 50 metres above the valley floor. Pre-assembly of the bottom formwork units and the all-round guardrail systems was handled by Doka’s pre-assembly service on site. And the team also takes care of installation and removal of the eight steel-girder grilles. The bottom slab is the first construction section of the pier head. It has a self-weight of 437.5 metric tons and during its construction the steel-girder grilles slowly drop about 10 cm. This had to be taken into account in planning and construction. The bottom slab subsequently carries the weight of the second and third construction sections. The project owner had drawn up a set of detailed requirements for facing-board patterning, joins and visible finish of the pier heads. The facing boards for each of the eight pier heads were set by site. Doka supplied the necessary planning and the material for two formwork sets, each consisting of 950 m² of project-specific Top 50 beam grills. Comprehensive fall-protection systems were also needed at the exposed platform ends for the second and third concreting sections. The superstructures of the new Lahntal viaduct are constructed toward each other from pier head to pier head. The cantilever forming travellers work in pairs, so that the horizontal forces acting on the bridge piers are always in equilibrium. Each pair of primary piers has two adjacent secondary piers. They stabilise the pier head at all times while cantilevering is in progress. 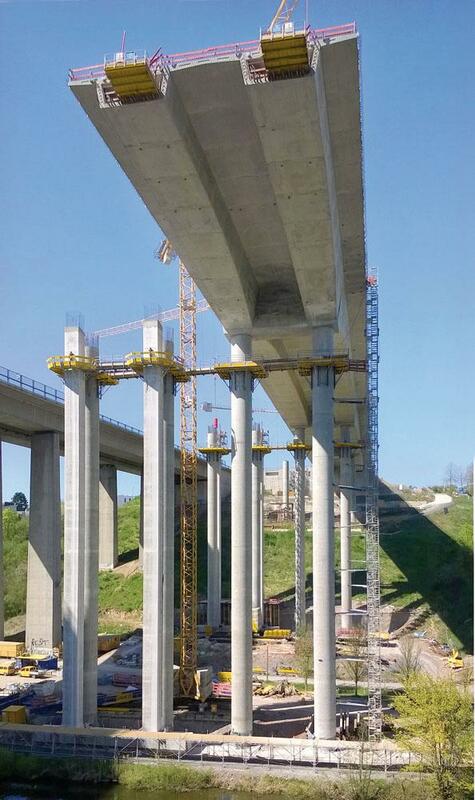 The secondary piers have a cross-section of 2.0 x 2.0 m and they are up to 50 metres high. 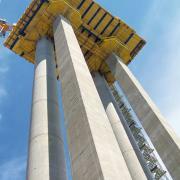 Lead contractor Bögl used its own slipform formwork to erect these stabilising structures. The monolithic pier heads of the secondary piers have an integral pier reinforcement consisting of steel beams. These pier heads were formed with two sets of Framed formwork Framax Xlife. Eight sets of working platforms provided the all-important workplace safety. They are used as the work-deck level and as setdown areas for additional working scaffolds for the construction and subsequent dismantling of the secondary pier heads. The cantilever forming travellers on the Lahntal viaduct each have four longitudinal trusses. They can handle varying section lengths from 3.75 to 5.00 metres and concrete weights up to 250 metric tons. Complete with platforms the bottom grid is 9.50 metres wide and 25.00 metres long. With formwork and platforms, each of the four cantilever forming travellers weighs some 130 metric tons. First to last, initial assembly of all the cantilever forming travellers was in the capable hands of the specialists from Doka’s pre-assembly on site. A total of twelve complete repositionings of the cantilever forming travellers had to be handled as well. 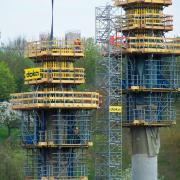 Doka also designed and built a special strand-jack platform using the Bögl company's own materials for cantilevering. This platform was used to hoist the bottom grids straight off the ground without the assistance of heavy-duty truck-mounted cranes. Through to the closing cycle, there is a 1.25 height variance at the bottom of the bridge's cross-section. So the bottom formwork telescopes in the area of the webs to allow for this difference. The inside formwork for the trough consists of a drawer structure for speedy repositioning. All the formwork elements come from the Large-area formwork Top 50 modular, 'building block' system. Fully integrated platform systems ensure safety at work. When the cantilever forming traveller advances an articulated carrier system automatically adjusts the bottom grid. Unlike the typical cycles, the closing cycle has to be cast in two concreting sections. The bottom and the web are cast first. The top-slab rails of the cantilever forming traveller are then extended without any prior dismantling. The concrete is then cast for the roadway slab. When the closing cycle is completed the cantilever forming carriage is brought back into position above the axis of the piers. Special retractors come into play at this stage of the procedure. With the carriage back at the piers, the bottom grid can be lowered. The carriage is then stripped down into big, largely undismantled repositioning units. Even the anchoring cross beams, more than 24.0 metres in length, remain in place complete with the platform. At night, massive heavy-duty haulers manoeuvre the units into position for work on the other carriageway of the new bridge. Thank you for your interest - Doka cantilevering for super-slim piers. Thank you very much for your interest - Doka cantilevering for super-slim piers.